Greetings ocean explorers! We arrived at the port of call where we will board the JOIDES Resolution, a 470 foot research vessel. This is a very, very large ship compared to most research ships. There is only one larger than the JOIDES Resolution. Can anyone name the largest research vessel? 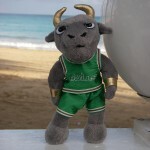 Rocky the Bull and Mr. Penguin both arrived safely, too. Your mascots enjoyed the beautiful weather by visiting the beach and lounging at the pool for a bit in the morning before riding to where the JR was docked. Later, at the port we met up with Michael Martinez, a USF graduate student in the College of Marine Science, who will be studying microfossils (foraminifera or forams) that are retrieved from the core samples. Forams are a very important because the shells of these tiny protists are commonly preserved in marine sediments. Foram shells are buried as part of the ocean floor and as fossils can tell us something about the environment when they were living organisms (e.g. water depth). To dig deeper visit Michael’s advisor, Dr. Pamela Hallock-Muller’s lab. 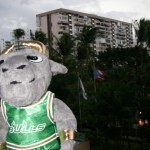 Rocky enjoying the view from the hotel in San Juan, Puerto Rico, Viva! Rocky liked the flag showing in this photo. Rocky enjoying a view of the beach in front of hotel… reminded him of home in Florida. 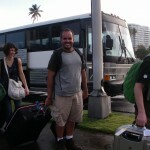 But not homesick, too much excitement about going on this 40 day journey to the Lesser Antilles from a research vessel. Michael Martinez, a USF graduate student sailing aboard the JOIDES to study microfossils from the marine sediments we will collect as part of the cores retrieved from the ocean floor. Like Rocky and Mr. Penguin this is also Michael’s first time on the JOIDES Resolution. Print article This entry was posted by greely on March 12, 2012 at 12:36 pm, and is filed under Oceanic Updates. Follow any responses to this post through RSS 2.0. You can leave a response or trackback from your own site.